Light green in color with hues of yellow, this robust extra virgin olive oil is crushed from 100% Coratina variety olives grown in the region of Northern Puglia. It is intensely fruity with pleasant bitter and spicy notes and a rich vegetal aroma with a harmonious, herbaceous aftertaste of almonds and artichokes. This oil is particularly excellent as a dressing on grilled meats, fried dishes, legume soups and grilled vegetables. 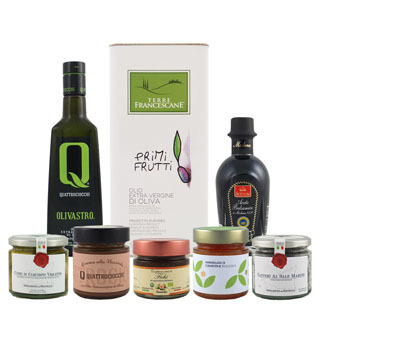 Located in the renowned production area of Andria, Puglia in the Castel del Monte territory, Fratelli Guglielmi and his family have been producing outstanding extra virgin olive oils since 1954. Combining both tradition and modern technology with careful attention to every stage of the cultivation and production process, Fratelli Guglielmi produces extra virgin olive oils of the highest quality, pressing their olives no more than 12 hours after harvesting. Thanks to the care and passion for the land and its fruits, the Guglielmi family continues to gain recognition for their outstanding oils. Strong and pungent oil pressed exclusively from 100% organic Moraiolo variety olives in Lazio. 5 Liters! Produced exclusively from 100% organic Itrana olives grown on the Quattrociocchi Estate in Alatri. An award-winning olive oil from Cordoba, Spain.